Stella McCartney is a sartorial best friend of sorts: Her collections are always very dependable, very flattering, but still totally interesting. Her latest collection lived up to all those BFF qualities, with a decidedly feminine touch. The silhouettes were loose and swingy, with culottes swishing by in navy and cream and handkerchief hems hanging off of denim skirts and crisp white dresses alike. This sense of soft femininity was reflected by the designer’s front row, which included Salma Hayek, Coco Rocha, Elisa Sednaoui, and Bar Refaeli. On the accessory front, the Stella girl kept it simple, with Lucite necklaces made of chains to toughen things up slightly, and little cylindrical clutches that blended in with their backgrounds. The clothes themselves weren’t overly intricate, either; knit separates were layered in monochromatic looks, a black silk dress was texturized with a few haphazard pleats, and a Members Only-esque jacket was transformed into a dusty pink dress. But the last few looks are the ones that are certain to garner the most attention, with their wispy butterfly-like patterns, accented with bold punches of royal blue and blood red. 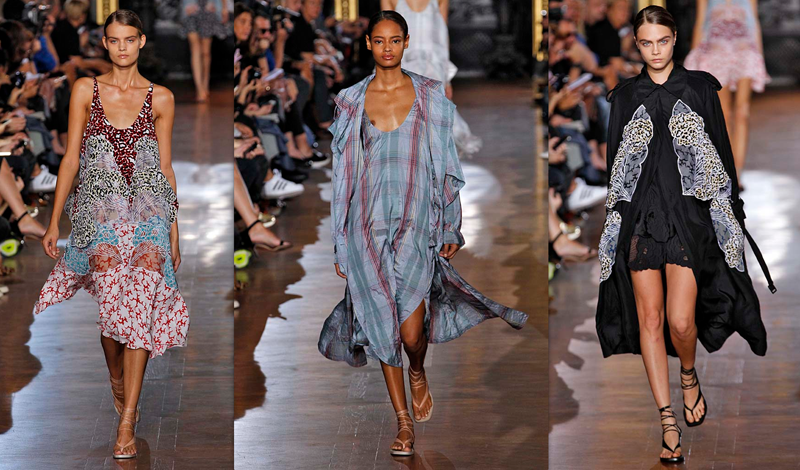 The prints adorned barely-there slip dresses, simple summer dresses, and even a stark black jumpsuit.